After the usual opening festivities (opening prayer, door prizes and the weekly winners of the Neighborhood Longhorns program, we were given a brief talk from one of the compliance officers in the athletic department. I did not catch her name. She said the big change this year was the addition of new rules regarding Head Coach Control. Apparently, she expects we’ll hear more about this in the coming weeks. In a nutshell, the head coach is now presumed to be responsible for the actions of all assistant coaches and administrators that report, directly or indirectly, to him or her. In addition, the head coach shall promote an atmosphere of compliance within his/her program and shall monitor the activities of all personnel involved with the program who report, directly or indirectly, to him/her. In the most egregious cases, a head coach could be suspected for up to an entire season. I, for one, don’t see this happening unless the coach is heading out in any case (i.e. conveniently moves up to the NFL). 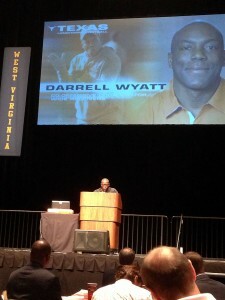 Bill Little came up to introduce Coach Wyatt. Before doing so, he let us know that this weekend’s game will include efforts towards cancer awareness. Players will be wearing ribbons that represent a cancer that has touched their lives, and they’ll probably be wearing some pink as well. Coach Wyatt began with a statement about how excited they are to start conference play against Kansas State game. Clearly, Coach received the talking points that they can still win the conference. Then, Coach Wyatt showed about five minutes of clips of highlights from the receiving corps. I’m not sure any other position coach could fill that much time with highlights. Coach then opened up the floor to questions. As always, take this with a grain of salt. It’s not a transcript, although I was typing as fast as I could. 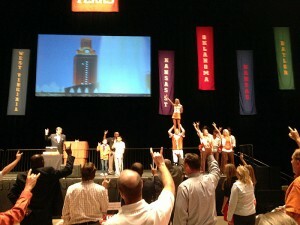 The luncheon is supposed to be shown on the Longhorn Network later, so watch it there if you can. Will David be able to play? Will we see Tyrone this season? I cannot comment on injuries. Coach Brown should announce something, maybe today. Tyrone has a strong arm and they’re working to get him ready to play. After what happened to Texas Tech, do you caution the receivers about carrying the ball all the way into the end zone. Yes, we coach ball security. It’s something we take pride in. What do you think about the rule that says targeting didn’t occur, but there’s a penalty anyways. Interesting question. I’m not on the rules committee, but I understand the intent of the rule and am all for protecting the players. During the Ole Miss game, was there any thought about switching QBs in the second half? Not during the half time. We had been moving the ball well. We know that you’ve asked the players to be accountable. How do you keep the coaches doing the same thing? Morale is a big part of this game. Our morale is good in getting ready for Kansas State. Our goal is to win the conference. We’re excited and looking forward to the challenge. Are we going to see anything different from Kansas State than what we’ve seen in past years? Can you talk about their starters? They have a new QB who is more of a drop back passer, but otherwise they should be the same well-coached team. Our job is to find a way to score points, to limit their scoring of points, and to get an advantage in special teams. How are we going to stretch the field and loosen up the defense to get our running game going? We always want to create explosive plays. We’ll take our shots over the top, and we have some playmakers that are great after they catch the ball.